Express your emotions on Valentine's Day with this Invitation of My Heart Valentine Combo to make the day special for the person whose presence makes your every moment worth living it. 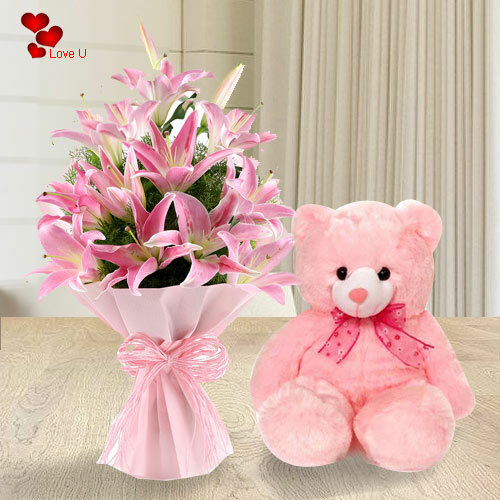 An exotic Bouquet of 6 Oriental Pink Lilies and a nice 6" Teddy are included in this combo. Flowers Delivery Faridabad, Send sweets Delhi, Wedding Cake Sangli, Diwali Mithai Kakinada, Send Flowers and Gifts to Tirumala, Online Shop Bokaro, Flower to Srinagar, New Year Flowers Mhow , Fresh Fruits Miraz, Send Gift Meerut, Dry Fruits to Ramgarh, Birthday Delivery Rishikesh, Sending to Haveri, Flower shop Ernakulam, Bhavnagar Online Cake Delivery.